“It’s a tip of the hat. 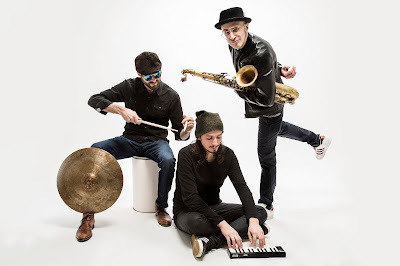 Thanks for giving us this inspiration and influence,” says drummer Nick Wight, explaining the concept behind the new album Legacy, that his band, Pericopes+1, will be launching at Pizza Express Jazz Club on 1 May. He spoke to Matthew Wright for LondonJazz News. The ten original pieces on Legacy were originally conceived when the band – Wight and Italian duo of saxophonist Emiliano Vernizzi and pianist Alessandro Sgobbio – was on the road, touring its last album, These Human Beings, during 2016, and listening to the music of so many musical titans who died during that terrible year. Some of the pieces in Legacy were trialled on their previous UK tour, in 2016, when they were also fortunate to have a period as artists in residence at Aberdeen University to workshop some of their new pieces – valuable time, when a trio is spread over three countries and two continents. The group’s road miles make it into the music in other ways, too. The new track Markveien was named after a square in Oslo, while Grossetto was inspired by an ancient Venetian currency, and also (in a slightly different spelling) a town in Tuscany. With an unusual, bass-less line-up of saxophone, piano and drums, the band's musical dynamic encourages a quicksilver lyricism. One of the most noticeable features of these new pieces is how quickly the mood and dynamics change. Red Sand Town offers radical shifts in tempo and mood, its frenetic opening yielding to reflective pools of saxophone melody, teased by ripples of rhythm. November Tears sees the trio at its most laid-back, with delicate, floating melody on piano and sax teased by Wight’s brushwork. Zardis, meanwhile, offers bracing stacks of piano chords offset by scurrying sax and a frenetic beat. There’s a palpable excitement from the band about their return to the UK, where they have big gigs in London, Birmingham, Manchester, as well as the Ribble Valley Jazz Festival and Jazz North East. Perhaps unusually for a touring band, nearly half the UK dates are in Scotland, where they had such a warm reception last time. “UK and European festivals have a greater appreciation for this type of music. We love playing in the right venues where people are open-minded about new, original music,” says Wight.